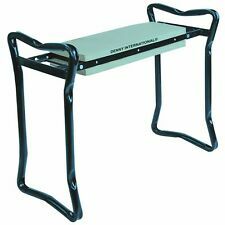 This is a versatile heavy duty Garden Kneeler and Seat stool. This can really help to take the strain out of gardening. This product can take the pain & strain out of gardening and make the gardening an enjoyable task. Made from durable moulded dense foam material. 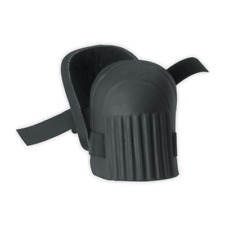 Durable Foam Knee Pads. Gorgeous garden kneeler. Covered in a wipe-clean, cotton canvas oilcloth, featuring a beautiful pattern drawn by Brie Harrison. Burgon & Ball RHS Gifts. 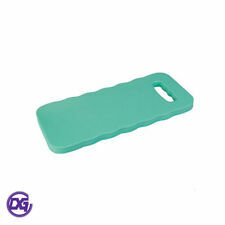 A shock-absorbing core of EVA foam with soft outer foam layers make this kneeler a superbly comfortable option. Kent & Stowe Foam Poppy Garden Kneeler. 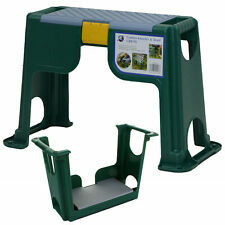 Comfortable garden kneeler to support and minimise knee and leg ache while gardening. This product is suitable for gardening, construction, outdoor labour and other operations. Gardening and Working. Perfect for gardening,house work. Triple layer foam construction provides comfort and durability. Triple layer foam construction. Hang up handle for easy storage. Hang up handle for easy storage. Size check: 40cm (16”) Wide 40cm (16”) High. In the kneeler position, the extended arms make getting up and down easier. This reduces strain and injury to your lower back and knees whilst also protecting your clothes from dirt and grass stains. 3-in-1 Garden Kneeler Seat. beds - then flip it over to sit whilst pruning bushes.  With tool pouch that can be fitted in both.  Can be folded in seconds for storage. SupaTool Foam Knee Pads. Industrial strength. The kneeler is also 1.5" thick, as thick as any pad you'll see on Amazon, making sure that you won't feel a thing on any surface. It's also proudly made in the USA. The inner layer's lightweight, water-resistant EVA foam construction pads and conforms to your knees for a comfortable fit and the single neoprene strap design makes them a breeze to put on and take off. 2-in-1 Garden Kneeler Seat. beds - then flip it over to sit comfortably whilst.  Can be folded in seconds for storage. pruning bushes. 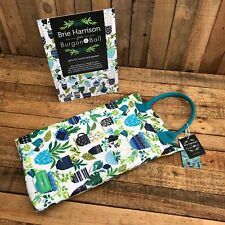 Garden Kneeler in an exclusive and contemporary botanical print by artist and illustrator Brie Harrison. Manufactured by Burgon and Ball Ltd. Wipe Clean. Weight 3Kg. Storage Areas for Tools. Great for garages DIY mechanic workshops or garden use! Praktische Knieunterlage für Gartenarbeiten. Damit Ihre Knie geschont werden. weiches Polster für die Gartenarbeit. mit praktischem Griff. Farbe: Grün. Maße: ca. 40,5 x 18 x 2 cm (LxBxH). This product is suitable for gardening, construction, outdoor labor and other operations. Gardening and Working. Perfect for gardening, praying, house work. We accept all major debit and credit cards. •Body contour designed for long wear and lasting comfort. •All purpose ideal for laying floor tiles, carpet, hardwood. 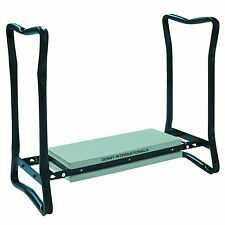 This versatile Garden Kneeler and Seat can really help to take the strain out of gardening.This product can take the pain & strain out of gardening and make the gardening an enjoyable task. This product is made up from robust steel tubing with a comfortable kneeling platform of EVA Foam. Foam Kneeling Pad. Handy kneeling pad. Knee protection. Handle for hanging or carrying. We will issue an RMA number. We will only accept the item back in the original new condition. Pain free kneeling increases productivity. Built-in handle, easy to carry. Providing ergokneel® mats shows that you care about your workers. These pads are great. 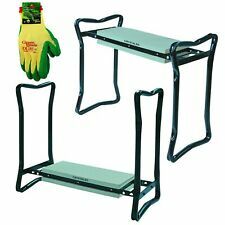 Use them in the garden, at work on concrete or steel, and even to sit on cold bleachers etc. The popular Strawberry Thief Garden Kneeler Cushion is kind to knees, nice and squidgy and a good size for all gardening chores. Strawberry Thief Garden Kneeler Large sized garden kneeler with lots of padding for extra comfort. • GENUINE SCION GARDEN KNEELER OR CUSHION TO SIT ON. • SPIKE THE HEDGEHOG. Looking for the perfect gift for a keen gardener?. Then look no further! The Gifted Gardener Kneel Pad & Gloves set is perfect for your green fingered friends and family. The kneel pad protects your knees and has the phrase 'Keep Calm and Carry on Weeding', whilst the flowery printed gloves protect your hands. Kneeling Pad. Grab handles for easy transport. Comfortable to work with. Low-slip surface for traction. Praktischer Gartenhocker mit Stauraum aus robustem Kunststoff zum rückenschonenden Sitzen oder Knien während der Gartenarbeit. Durch das Umdrehen des Hockers erhalten Sie eine komfortable, gepolsterte Kniebank. Kneeboard, EZ-Kneeler. Kraft Tool Model No. Tool Belts, Tool Bags, Knee Pads and Work Gear". TWEEDMILL GARDEN KNEELER/EVENT CUSHION WITH WATERPROOF BACKING & CARRY HANDLE - TWEED/BROWN. You can be certain of receiving the highest quality British made product. A beautifully made Garden Kneeler to make life a little more easier in the garden giving knees comfort and protection during wedding and planting. The removeable, replaceable foam pads allow the fabric cover to be washed (not included). Designed to be used with POPULAR LIFE Original Washable Knee Pads. EASY TO USE: Popular Life Original Washable Knee Pads (Not included) are designed with washing in mind, complete with an easily removeable, replaceable foam pad insert. 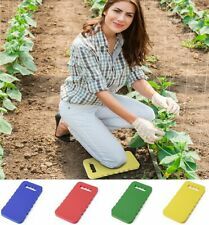 Comfortable kneeler protects knees while weeding or planting. Machine Accessories. Lightweight and easy to carry. Kreg® Jig Screws. Product Images. Work Support. Woodworking Projects. Ventilation & Air Conditioning. 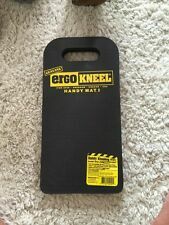 Ergo Kneel Handy Mat 8" x 16"